Tonight I went to see Star Trek II: The Wrath of Khan with my friend aL. The Paramount is showing a mini film festival of old films on the big screen. The sold out show was as wonderful as one can expect. Many in the crowd dressed up, we had a Klingon, someone in a First Contact-era uniform, an Enterprise-era uniform, an original series uniform and more. Geeks, in other words… I was among my own kind. Khan is generally considered by the whole world to be the best of the Star Trek films. I disagree, and put it at number two, but it’s still damn awesome. So for the five people who have never seen this film, how about a brief summary? 15 years earlier, Captain James T. Kirk and the crew of the U.S.S. Enterprise encountered a seemingly lifeless earth ship from the year 1996. Aboard the ship, they found cryogenically frozen men and women; once awake, these genetically engineered supermen used their superior knowledge and strength to gain control of the Enterprise. The Captain and his crew regained control of their ship and abandoned the supermen to Ceti Alpha V.
Commander Pavel Chekov, first officer aboard the U.S.S. Reliant and former bridge officer aboard the U.S.S. Enterprise, is looking for an uninhabited planet to test the new Genesis device. While surveying Ceti Alpha VI, Chekov discovers Khan, it turns out they were on Ceti Alpha V all along. Khan and his group of supermen overtake the Reliant and her strand her crew on the planet. They head off to Regula I, where science is happening to make project Genesis. Now-Admiral James T. Kirk is evaluating the U.S.S. Enterprise under the command of his old first mate Spock, he receives a phone call from his old flame, Dr. Carol Marcus, yelling and screaming about Kirk taking away Genesis. He must spring into action. He takes command of the Enterprise and heads to Regula. Where he encounters Khan, out for blood. And throughout this film, Kirk’s perm looks fabulous. Okay, fine, that wasn’t brief. & McCoy" data-image-description="" data-medium-file="https://www.neverhadtofight.com/wp-content/uploads/2010/02/trinity-tos.jpg" data-large-file="https://www.neverhadtofight.com/wp-content/uploads/2010/02/trinity-tos.jpg" class="alignleft size-full wp-image-410" title="Kirk, Spock & McCoy" src="http://www.neverhadtofight.com/wp-content/uploads/2010/02/trinity-tos.jpg" alt="" width="200" height="265" />The question I’m going to pose to you is, “is this really what Star Trek II is about?” I don’t think it is, I think the entire story of Khan, and the story of Genesis are just background. Yes, it makes for a great setting for the story to unfold, and yes, Khan is an incredible character, wonderfully brought to life by Ricardo Montalban, however, it’s about the Trinity. 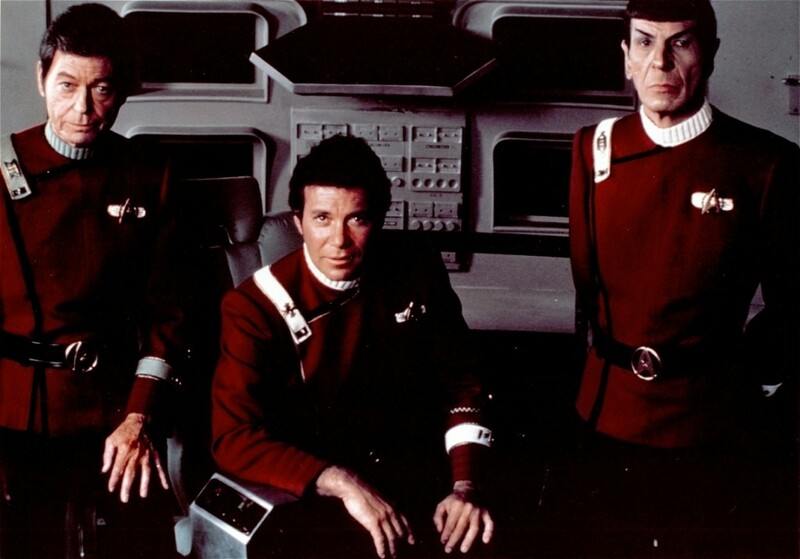 Where Star Trek best succeeds is where it best succeeds in Star Trek II; The Holy Trinity. 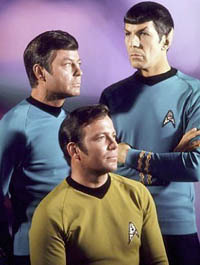 Kirk/McCoy/Spock – The Captain, The Doctor & The Holy Vulcan. I’m going to discuss all the films and how they fall into this logic in a future post, but first, I’ll talk about what it is in this film. In Khan, Kirk is old, he’s tired, he doesn’t want to spend another year hidden behind a desk wondering where his glory days of past have gone and why they won’t return. He wants to galavant amongst the stars, and be the captain he once was. Kirk is pondering his age, seeing his mortality and wondering about that no-win scenario which he has always cheated. McCoy guides him, Spock serves him, without these two, he cannot get where he needs to be. McCoy is his realization; his purpose is to allow Kirk to realize why he’s miserable and unable to fulfill his own happiness. Spock is the solution; in the end, Spock is there to take the fall for Kirk and make sure the Admiral never has to experience that no-win scenario. What Spock doesn’t realize is that the death of Spock is a bigger loss for Kirk than if he lost his own life. In a future post, we’ll discuss how this relates to those wonderful and piss-poor Star Trek films. How about commenting and telling me if I’m right or if I’m wrong?